All right, guys. 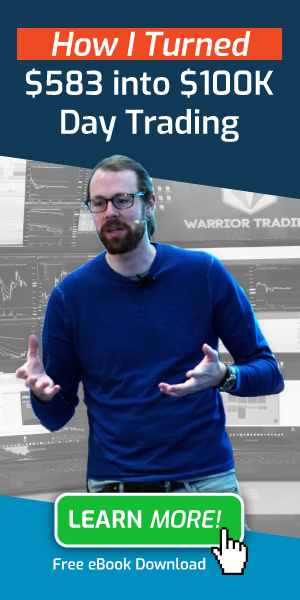 Here’s Roberto Barbaro, and I am trading educator for Warrior Trading. 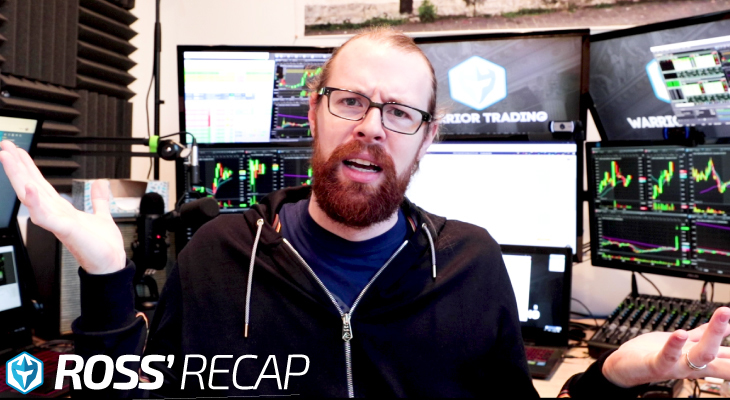 Today, as every other week, we are going to talk about my trading weekly recap. As you may remember if you watched last week video, we were actually pretty deeply into the red. Last week it’s been my worst week of the year so far, and I actually ended up the week with zero green trades, only three red trades, and so the only thing I was kind of okay with was the fact that I was able to keep those losses under control, and not really dig myself too much and too deep into the hole because this week has been totally a different story. This week I took another total of six trades, and I ended up green on five out of those six. So we were also able to get back to about 50%, and took profit to loss ratio above 1.5 to one, even just slightly above. So those stats are definitely getting better and I am now definitely more optimistic when it comes to the second part of the month. So enough talking about the stats, and let’s dive into the trades. On April 8th I took two trades, the same name. First was the three minutes upper range break down, and then the three minutes continuation of ROKU ended up with just small winners. The emotional state at that point was really coming into the week with not very high expectations. I just wanted to just turnaround and start making some greens so that I could make up, also, for what I have actually done on the first trades of the month and during the previous week. 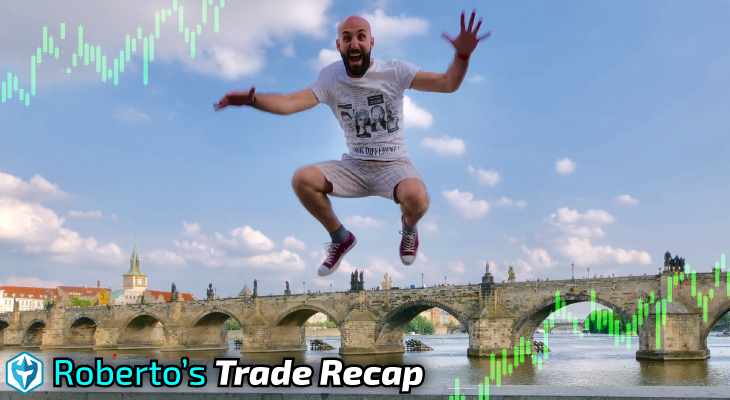 Let’s go and analyze exactly what I saw, and where I entered, when I exit on both the trades, and how I ended up managing those trades. ROKU here this was the day we are talking about. Here on the left, as you can see here, we do have … We do have here that three minutes chart, and then here in the top right we do have that 10 minutes chart, and here on the bottom right corner we have the daily chart. The daily chart on April 6th actually was this candle here, this green candle, but it was gapping down on some news. I couldn’t really remember what the news was about, but it was very bearish, and as you can notice here, also, the premarket pattern was looking very weak. We had lower highs and the lower lows, and so we had this kind of scenario moving into the open. As usual, when we have this kind of scenario I look forward to have potentially a first three minutes candle to confirm going with the trend, especially for a downtrend, and so that I could eventually take the continuation. What I ended up doing here as soon as the first three minute candle was over, I waited for a second minute candle to open. It actually opens, and right after the open it pushed for a little bit, and it started selling. So this type of scenario I got short. I anticipated a little bit the break of the previous lows, so I ended up entering here at 59.05 here, so up here. So the actual situation was as follows: so 59.05 is where I entered, so we had this push, and then it started selling. On this price action, weak price action is when I got in. I got in here, and I ended up taking my first partial third of the position off for here for around 58.60. So 58.55 and right after that we had an immediate support, and the price got back up to my entry. That’s when I stopped out the rest. I have this rule in place as soon as I am into the green, and I take the first third of my position off. If it comes back to my original entry, it’s time to get out, and lock that profit for the trade. That’s what I did the first time. The second time I actually ended up doing a similar kind of approach because it was working for the trade anticipating a little bit the entry. This case I enter it at 58.95 a second time. At 58.95 here after this consolidation below the VU up it started selling once again, and I enter at 58.95 here. So back short here and, once again, I took profit here in this deep, and around 58.45. At this point, I was feeling confident because I took off my first third of the position. Of course, it was trading at actually slightly below the previous low of the day, but instead of moving further down, this thing got bought right back up, and started pushing and, once again, I stopped out. In this case, I stopped out a little bit later. I ended up getting a smaller profit than I ended up with the previous trade because I got a little bit of slippage, even though I wanted to stop out on the same price of my entry. I ended up, of course, waiting for a little bit longer to see if this area would have been getting actually rejected once again, but it didn’t, so I stopped out the rest, and I got out with a small winner. I wanted also to add a little bit more details. I always do it when I don’t really strictly respect the rules that I use to trade with, which actually kind of impose me to enter the first candle to make a new low, and then in both cases, I anticipated the entry, and they ended up both being good decisions, despite the fact that we did not have the follow through we were looking for. So overall, mentally I just wanted to be green on the day to start making up for those losses the previous week, and that was it. I was actually able to do it, and so my confidence slowly got better, and then we dive into the Tuesday when I took no trades. 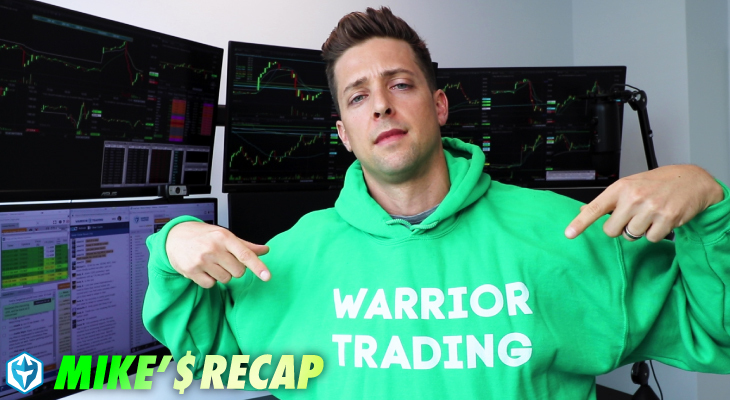 There were no trades that really I believe that was actually worth to taking, even though there were a couple of movers that I ended up missing, but I would actually enter more in detail of anything that I missed and why more in the mental sections available to all the Warrior Pro students when I do my mental sessions. In any case, I took no trades on Tuesday, and then I took one more trade on Wednesday, and it was on Delta Airlines, DAL. It was on earnings that they … I ended up taking a three minutes continuation. Three minutes continuation was here, so in this case it was a gap up reversal, so this thing was pushing on earnings, and whenever I have a gap up like this, especially on earnings, all I’m looking for is a non-bias approach. What I actually define as a non-bias approach is the fact that I actually am not strictly obligated to take the trade on one direction. So if it’s coming up, some traders will only be looking to go higher, but I actually look at it both ways. Eventually, I could be taking it going lower. In this sort of case for a gap, just for you to know, that’s not the case for a gap down. I would only be looking for a continuation down. I would not buying it to the long side, but that’s a different story. In this case on Delta, I actually had this letter here for premarket. It was a previous support, and then, of course I also had market here, had marked my premarket highs. So all the way to the open, actually, guys let’s be honest. This thing was looking bullish. We had our first push, and from that point on this thing was holding, and was making higher highs, and higher lows. So all the way to the open, as usual, I know I’m open not to have any bias, but at this point I was leaning towards more upside. You know to the long side than the short side, but as soon as the market opened, here is what happens. The first three minutes I don’t take any trades and we had a good volume, good selling volume right into the open, and we ended up getting right here into this support zone. We are now below this line here, the orange line, which is the 30 EMA on the three minutes. This blue line, which is the volume weighted average price, I view up, and this yellow line, which is that 13 EMA coming off of the 10 minutes. In order for me to take a trade, I always need to be on the side of the three of them, so I don’t want to take a long when I am below one of those, and I don’t want to take a short when the price is above any of those. So in this case, we sold off all through those potential level of support, and so I knew at this point that the stock was pretty weak. It was pretty big weak, but I ended up not taking that three minutes upper range breakout, sorry breakdown here, just because it was just too much happening in too little time. I wanted this level to become fulfillment from it breaking, and so here this three minutes candle here confirmed that we were rejecting this area here of strong resistance, and so I took it short over here. I ended up actually getting in at 58.03 here, so here I am anticipating just a little bit on weakness this three minutes low here, and as it happened the previous day, this thing start working. I take profit in the first third, and then it gets bought back up right away, and I stop out the rest. I only take a partial profit here in the first of the position, which was okay. In this case, there was a conf call about to happen at 10:00 a.m., which actually ended up happening here. I don’t really love holding my position all the way into the conference calls because you never know what’s going to happen there, what the CEO is going to say, and so that may affect that stock price on one way or the other. Since we are day traders, and so we are risk managers first, we don’t want to find ourselves in a situation where this thing starts shooting right against us because the CEO just told something during the conference call. You want to be aware that that’s actually going to be held, and so you definitely want to mitigate the risk and either closing the position before it happens or reducing your size in that dramatically before it happens. In this case, actually, after the conf call, then the move continued, but for me it was over. 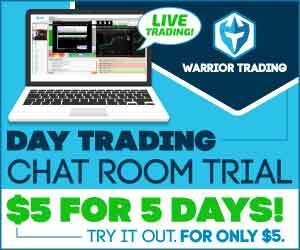 Other traders in the Warriors Trading Chatroom ended up playing this beautiful bear flag here. I can make it easier for you to see what I am referring to, so that you know. This was a very nice three minutes formation here, a very nice bear flag. As you can see, it was still holding below the major moving averages. They were also very close to each other, and whenever that happens we call it confluence level, so this confluence area here give even more strength and higher chances of success trades because you’ve got to remember. You are a trader that is not trading alone. There are other thousands and thousands of traders looking at the same setup, so one trader may play it against the 10 minutes timeframe. One other trader against VU up. Another more aggressive trader against the three minutes, and so all of those create more resistance. In this case, as soon as the price actually got cracked below this flag, it continued further down, but I did not take the trade because of the conf call, and ended up taking also only this entry here on this three minutes, on the three-minute formation, and getting stopped out back up at my original entry, but it was one more green trade. One more green trade, and now it’s the third green trade in a row after my red streak of three red trades in a row, and was feeling even better, and ready to jump into the next day. The next day, so Thursday, I had the best trade of the week and, also, the best trade of the month. 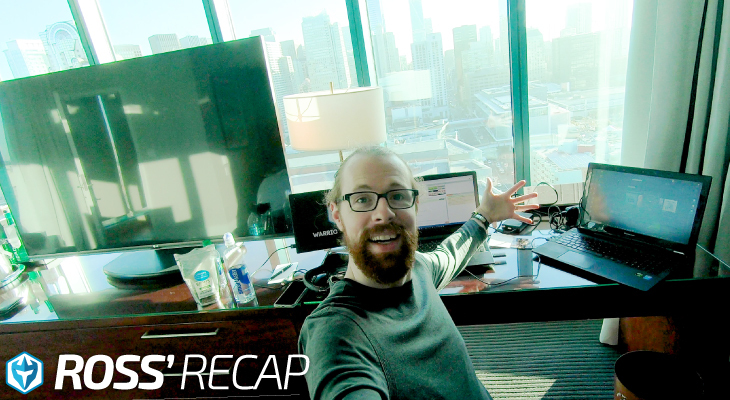 Let’s break it down right now and talk about what happened, and why did I take the trade, and what did I actually ended up loving for the trade and, also, as a setup. So it was about W to W. WW is Weight Watchers and we were actually seeing here that … Right. There was a downgrade and, also, what I liked about this was this daily formation. If you look at what happened here, you may notice that 52-week low was actually here. As of yesterday, it was at 18.80 here, and it happened right before this huge gap down after the latest earnings and there was a very negative catalyst yesterday. They kind of lowered the guidance for the company, and so I noticed that the volume was good here during premarket. I usually don’t take into consideration anything that doesn’t have at least 50,000 shares traded in premarket. We were well above it here, and I liked the formation here. We are making lower highs, and lower lows, and it was very, very much smooth going into the open. The only problem with this it was that right into the open here it was actually getting a little bit extended from the 13 EMA, and then I did not like that for a potential trade. I just ended up waiting to see. Of course, as usual, never take a trade during the first three minutes of when the market is open. I also advise the people in chatroom to be careful because this like a little more like a bear trap, at least into the open. We exactly had that, so the market opened. This thing flashes down all the way into new lows at 18.34, and then the next thing you know, it gets about right back up, and it started to actually push so this thing if you happened to short it here at 18.40 area, three minutes later you are like 60 cents or more into the red, which is something completely avoidable. Just not having the rush to get in as soon as the market opens and, also, taking into consideration that it was getting overextended at such an area. Of course, here now you can’t notice it anymore because down here this is my custom made … I coded it myself, actually, so it’s a custom-made EMA divergence indicator. Of course, now, it is taking only into consideration the close price of the candle, but when the actual price was actually down here, this thing was way up, signaling a divergence. It was way too much overextended. It was above the 2.75% extension from the 13 EMA. I would have eventually not taken even the three minutes upper range breakdown here because of the overextension. Instead, I waited for it to give a little bit of, eventually, a better scenario. Actually, these ended up happening. The first opportunity ended up happening here when it got slammed back down below the 18.80, but I wasn’t feeling enough convinced about this one trade here because of all the action that happened before, and so I waited for a little bit more confirmation. I watched the price action. I noticed it was continuing down, and so the next thing I wanted to see was consolidation right below the 13 EMA of the three minutes. That’s when I got involved. Actually, since this one was in short selling restriction, I anticipated the short here. I got filled at 3,000 share at 18.45 here. As soon as this tested and failed below that 13 EMA, actually, the candle was this one. So I would have actually gotten stopped out back about the 18.55-18.60 at most, but what happened next was what I like the most. This thing just started selling off, and then went, of course … Sorry. I actually took the wrong one here, but at 8.45. Let’s just play this one for you, guys. 8.45 here with a stop above here at this area. It ended up just beautifully collaborating. So I started taking profit at 1.5:1 profit loss ratio. It went actually a little bit lower than that because, actually, this stop area, to be honest, was a little bit higher, was eventually here at 18, more closer to 18.60 area, and so a long story short, I take one-third off, two-thirds off as the move continues going down, and I ended up taking my last piece at 6:1 profit loss ratio over here at 17.70, actually. So it was a beautiful move, a lot of other members banked on it. It made my day. It made also my week. At that point, I was able to turn the week and, also, the whole month into the green. At this point, in four days after beginning my month not really with a high note, I was able to turn it into the green, so that’s what I always say about patience, about being disciplined because, eventually, the market is going to give you the opportunity to come back. It is going to be giving you the opportunity to get back green. So that was yesterday and today I ended up taking two trades on Netflix. It was a very strange day. I missed the first move of two different stocks because I was watching a third stock, and I ended up basically being flat on the day. So one red trade and one green trade ended up on Netflix, and let’s talk about it one minute with you for you guys. So let’s just roll back to this morning. This morning I was watching. This is actually my live trading signals here. All the others that put in chatroom real time, so at 9:13 I done my watch list, and I had Disney, DIS, JPM, JP Morgan, and Netflix, all three of them I watched. Of course, my first one was Disney. 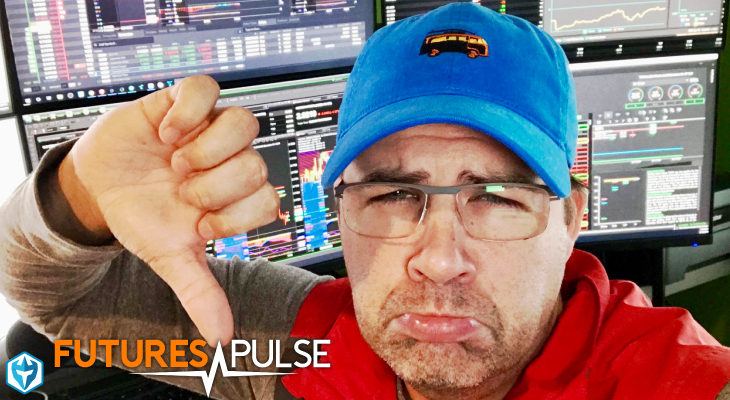 The first one was Disney because it was gapping up, tremendous volume, tremendous interest around the stock, a lot of … Basically, it was all over the place. That thing ended up distracting me from the other two, the JPM, and Netflix because here is what I want to actually show you guys because JPM … I like Disney. They ended up, for me, not getting any very strong opportunity. Look at this. It was just a textbook opening range breakout trade. It was gap on the earnings, and consolidating higher, making higher highs, higher lows, and then this thing opens, and it dips a little bit, but it held VU up the 13 EMA on both the three minutes and 10 minutes, and it started pushing back up. Here when it makes a new high it started pushing. Here is that signal to get an entry. At 1:10 here it was beautiful, risking just a little bit here. It was about 25, 30 cents risks, but this then gave more than a point. It gave four times as much, like in the following 15 to 20 minutes. Because I was watching Disney, Disney today look at this. It was a crazy move here. I missed it because it didn’t align with my risk reward. I don’t take trades in premarket. This move was just crazy. Look at the volume we had premarket, like 7 million shares traded already premarket. This thing opens and it’s all over the place, but not only it doesn’t give me any opportunity to get in following my strategies but, also, distracts me from this, JPM, first move and, also, the first move happening on Netflix. Netflix was gapping down on kind of the same news that we had on Disney, but reverse it, so it was gapping down. It was quite interesting looking, also, on the daily coming out of a wedge here. We can actually give a look here one second to give a little bit more perspective. This thing ended up forming up a decent potential break of this area here, this trendline, the support, and so I knew that it was eventually going to be interesting to watch for a potential trade. A long story short, it was consolidating. It was having decent premarket volume, decent premarket pattern here. It was looking pretty weak, and as soon as it opens the first 10 minutes jump, finds support here on the premarket lows, as well as this trendline coming off of the daily. On the second three minutes here, right when I’m distracted watching Disney, and ended up rejecting the 13 EMA on the 10 minutes, coming back down it started selling. Here it was the best possible entry. 3.58, 3.57 area and it just comes all the way down and it goes all the way to 349, which was actually also a level that was clearly visible on the daily chart. When you look back what’s the low of this candle? What’s the low of this one candle here? 349.20. We just have it here, and look at what happens. It’s exactly where this thing bounced and, also, it was exactly where the potential of this window happens, so it ended up selling off here for 358 all the way to 349. It would have been another home run trade, but I ended up missing my entry and, at this point, I was a little bit getting upset with myself, but instead of jumping into anything, I decided to wait for the reset up. So the reset up happens here and it ended up being pretty clean here, actually. We had this three minutes candle here trying to reject the 13 EMA, and the VU up, and what I ended up doing, I ended up going short. Right? I ended up going short. The risk was pretty tight, so as soon as the second three minutes candle opens, it actually was here, and I ended up getting in at 354.15, and I was looking at the first target. I was looking right here at this 252.50 area, but as soon as I entered this thing started selling off, but then it got about right back up, and stops me out, stopped out at 355.05. I was feeling pretty frustrated because I had missed this move, and then I got stopped out on a more than decent technical setup, but instead of me just giving up, I was about calling it a week, and I see this formation, the 10 minutes. So as you can see over here, at first it took a three minutes continuation where it took that last one up there, and then my last trade of the week was in the same name, Netflix, and was a 10 minutes trend initiation. So 10 minutes trend initiation here. I actually put it here for a second. So three minutes trend initiation, sorry, 10 minutes trend initiation happened right here. As soon as this thing started selling, then it pushed back above VU up, and I always take a look if the 13 EMA from the 10 minutes actually holds. It ended up holding, and it started rejecting that level, and at that point I am getting interested. I am getting interested if we lose the VU up level once again. On the next 10 minutes, I watch the price action. It starts to consolidate. It tests the VU up a first time, but I’m not convinced enough. Let’s also look at what happened three minutes, so we can have kind of an inside look at what’s happening then explain what happened here. So first rejection here on 13 EMA of the 10 minutes. It start getting weaker, and it forms here this nice wedge. It was forming this nice wedge, so we are … Actually, to give you a context we are here in this 10:20 or 10:30 timeframe. I’m looking at it, and I get interested to eventually play this one candle here. Right? So not only it would be actually selling below of this wedge here. Also, it would be exactly right below the VU up, and the 13 EMA on the three minutes, which I am still considering all the way to 10:30 a.m., so we are both aligned here at exactly 10:30. As soon as we sold off here, that’s where I entered. As you can see guys, here, and my second entry at 10:34 at 355.75. So it’s exactly this three minutes candle here. 355.75, and here on the 10 minutes that’s where we are selling. We’re selling back below that VU up. Selling back below the VU up, and this thing starts just collaborating. So it’s collaborating, and I took my first bit off here at 354.60. At that point guys, I just felt the fatigue. You know the fatigue, the mental resources from all the week, and even for the day it was getting a little bit late, so as soon as this thing came right back up, I just stopped out the rest at 354.95 for what ended up being exactly the same amount as a winner that I had on my previous loser. I ended up my day with a total zero, so I ended up not making any money, but because of the come back, I was definitely feeling good with it. I actually wanted to put here a note because I did not respect my plan, especially in the second. On the second exit I just wanted to be at that point to be back, and to be closing the week, not being red, but I also wanted to put this note for me. So I felt mental resources were running low because we were on Friday past the 10:30 a.m. I really liked the setup I took, and I actually back in my mind I wanted to come back flat for the day, which is not really the good approach that we want to have, and so I kept a little bit of a focus on my P&L, ending a play the technical setup then in full. I ended up making back the money I’ve lost in the first trade, but I still have to learn and I still have potential opportunity to learn more from this because this is a good setup, definitely a setup that I like but, also, I got to understand that what my rule says is that I need to be continuing holding the rest of the position unless I get stopped out. Right? So my stop out would have been back here at my entry point at 355.75 right here. This one ended up actually not being retested here. That’s why I stopped out the rest, but it gave a little bit of continuation. Nothing incredibly special, but you got to understand guys that this could have actually gone even more and farther down, and gave me a home run. In that case, I would have missed the whole home run. So it did not happen this time, but the reminder here is always to be taking the trade where it makes sense technically, and not letting you driven by P&L or anything else. The only thing that matters is the single trade, the technical of that trade. That is the lesson from me today, and we also got to understand we are all humans. We all make mistakes, but I was definitely happy to end out my week well into the green, flipped my entire month now into the green as well, and looking forward to next week to come back, and take trades. I hope you enjoy the video. Make sure you push the like button if you like the contents, and the insights, and you post any possible questions you might have. Make sure I come back and answer to each one of you guys. So thank you for watching and I’ll see you back in the chatroom next week. Hey, hey, hey, you. Don’t forget to like this video. Leave a comment down below, and subscribe to the channel to always stay updated, and to make even more step towards your financial freedom.